Fun time but nostalgia relived! 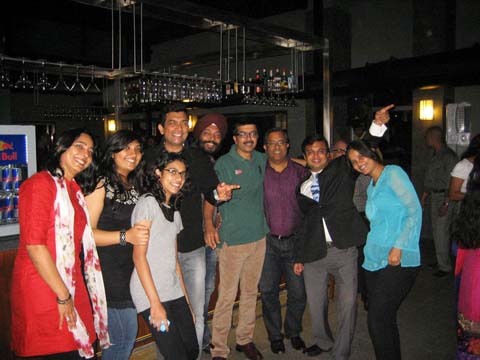 Back to work on this rainy Monday morning but what a night it was on Friday July 27th – our office party held at a venue close by, and we all celebrated and partied hard to mark the completion of 16 years of Khana Khazana India Pvt Ltd’s existence. It was a totally masti filled evening – time to let the hair down, with a rocking DJ, superb Mediterranean starters and food and an open bar. Needless to say, everyone turned up, dressed to kill and ready to set the floor on fire. I must say, I was so surprised that my team put together a short film to portray our journey through these years…a big thanks to all who have put their hardwork in creating something so beautiful and touching. I definitely lived through the whole story with strong nostalgia, right then and there! Just after the AV session, we had an award ceremony to felicitate the team mates who have made significant contribution to the company’s growth – those who have been dedicatedly been working day-in and day-out to bring the company to this pinnacle. Presented them with trophies and certificates amidst loud applause! Employees of the year were Sheetal, Jaaie, Saurabh, Pawan and Bipin. Some of the other trophies went to Rajeev, Harpal, Miti, Neena, Anupa, Satyaki, Sanjay, Ravi, Saurabh Saxena, Nanette…. I thank all my guests who came – difficult to take all the names here but felt so good and comforted to see Dr Ram Prabhoo with Meena bhabhi present there with their smiling countenances and blessings. We go back a long way with them and they have helped us out in the direst times so many many years ago. Alyona got a bit emotional while telling about their roles in our lives. 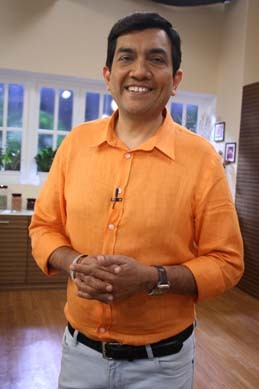 Dr Ram actually put on a chef’s hat and gave a recipe that he feels has helped me succeed. Thank you, Dr Ram for putting it so beautifully. Rajeev, my elder brother, was there throughout the party. He is the reason for the existence of this company and I whole heartedly admit it. My friends and business associates opened out their hearts and gave their perspective to the growth in the future. I liked what Ravi Saxena said about all verticals should now work in synergy. I reiterated it in my message to my team – that not only should we work in synergy but should also dream bigger! Harsha Bhatkal, as usual, was his chirpy self, and gave his version of our first meeting which I am sure must have surprised the ones who heard it for the first time! We had invited our ex employees who have still kept their bonds with us intact all these years, inspite of moving out and moving on in their respective careers. Sunit Purandare sent us a recorded message from London – Aditi Mehta, one of first chefs, came and delivered a short message spoken from the heart, and Chef Debashish Mukherjee brought the house down with his tale of how he got into Khana Khazana! I feel proud of all those who have made it ‘big’ in their lives beyond Khana Khazana, and I wish that they just keep on rising and shining in their lives. Then we also had the cake cutting to celebrate, slightly preponed though, the birthdays of Rajeev Matta and my younger daughter Kriti. I feel special times like these are what memories are made of – to be cherished – be relaxed and happy, and forget the strenuous everyday schedules. Kudos to everyone who silently put together the whole show with such panache and made it possible for everyone to enjoy so much! And also sharing some of the great bites like the ones we had enjoyed on Friday…go on and relish them! All set for the office party on July 27, 2012 to celebrate 16 years of Khana Khazana at a venue very near to my office. It’s a real proud moment for me, and I can say the same for the team who has worked day-in, day-out to get the company at this pinnacle which it is today! And what better way to celebrate this moment with the present lot as well as some of the ex- Khazanaites! Most of the events of the party have been kept as a surprise to me, so will be able to tell you after the party…not bad, it’s good to get surprises! Besides this, as usual, there will be loads of food, drinks and dance and everybody, dressed in their best, shall have a gala time! Will post the after-event pictures as soon as it gets through…keep a check! And while everyone gets ready for the party mode, I’ll be wrapping up the new schedule of the Sanjeev Kapoor’s Kitchen shoots going on in Goregaon. While, I was on my trip to Georgia, I made sure that I got myself educated with the traditional Georgian food and picked up a few books. So, this time I’ll be including some Georgian recipes also in my episodes, and trust me they are simple and as delicious as they can be! Tomorrow is the formal board meeting of our restaurant vertical ICPL. We will share the growth and chart of the future. Besides this, August will have me travelling again to various places for some upcoming events and I will keep you all updating as and when they take place. Just returned from the Pink City of India, Jaipur. Amazingly clean city, such wide smooth roads, a dream to achieve in Mumbai! Alyona had given me a small list of things to pick up for her from Johari Bazar, famous as it is for semi precious stones and lehriya sarees…and of course, the famous mithai ghevar! I had the most exciting Live Show there organized by the Dainik Bhaskar group. Got a chance again to interact with a great 2000+ audience and cook some vegetarian recipes like Crackling Spinach Raita, Kachchi Sabziyon aur Mangodi ki Biryani, Soft Centered Chocolate Cake…naming just a few. It always has been an exhilarating experience to travel to this part of India, steeped in culture. Looking forward to more such trips in the near future! In office, the photo shoot for the upcoming book on chocolate just got over the previous week. Of whatever I’ve seen, there are some stunning shots captured by photographer Bharat Bhirangi and his team. Also, my team made it possible to bring out the chocolate recipes in the best form…this book is something to definitely look out for, especially for chocolate lovers! Keep a watch on this space for more updates on this sinful ingredient! Simultaneously, recipe trials for a book on easy everyday cooking are done and finished with. The photo shoot is in the offing, scheduled next month. 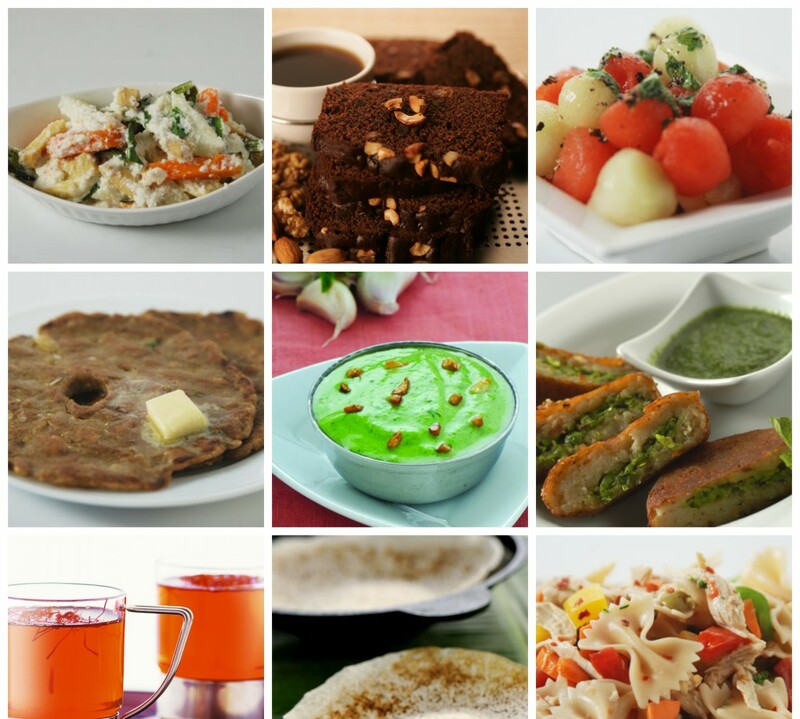 Just a sneak peak into the book – it is a compilation of all those quick and easy recipes which a housewife can ever dream of for a hassle-free daily menu, all being presented in new avatars! What was boring before could well be renamed interesting! Also, a new schedule of Turban Tadka shoots is full-on in the office studios. It’s light, camera, action time for Chef Harpal Singh Sokhi and things will remain as busy as this till the week ends. So, there’s much chahal-pahal going on in the office besides the normal work routine. Besides this, preparations are on for a party to celebrate 16 years of Khana Khazana on July 27, 2012 at a venue very near to my office. Will keep you posted with our places and post event photos. Returned last night from a good business trip to Georgia – had a great time exploring a new country as well! Thought I might as well relax a bit because just after this is my next trip. I am flying out to Dubai tonight with Alyona and a few of my team mates. While in Dubai, I will be addressing the Press Conference of Sadia UAE Ramadan Cooking Challenge 2012 that will be aired, prime time, during Ramadan and Eid exclusively on Etisalat’s emasala, emasala+2 channels and my channel FoodFood. Here’s the gist about the show – the Sadia UAE Ramadan Cooking Challenge 2012, co-presented and judged by Saba Wahid, a prominent TV personality and culinary expert, will be shot at Meydan Hotel, the exclusive venue for the world’s richest horse race – The Dubai World Cup. The show will comprise 30 episodes where the contestants will be challenged to bring out the hidden flavours of the Middle East, South Asia and other regions. The Grand Finale is scheduled to be aired on the day of Eid and the final contestants will be judged by me, along with Master Chefs from The Meydan Hotel and Gaurav Tandon, one of the most celebrated Asian food critics in the Middle East. The grand finale will be wrapped up with an evening filled with food festivities. I have a soft spot for Dubai, for sure. Fifteen years ago, my first restaurant came into this world, that is, in Dubai. Now my TV channel FoodFood, which is just over a year old, is doing its first big international collaboration in the form of Sadia UAE Ramadan Cooking Challenge 2012! UAE and its residents have a special place in my heart and this association is just the beginning of a long journey. I am greatly looking forward to this event with excitement and enthusiasm! There’s more! In office the photoshoot for the upcoming book on Chocolates has begun. 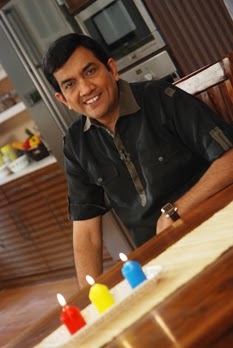 Photographer Bharat Bhirangi alongwith his team are working on creating some beautiful shots with the chocolate recipes. Just got a nice shot of ‘Death by Chocolate.’ Looks absolutely sinful, so sharing with you all as well! How can one overlook beautiful Goa when in search of Indian food recipes? Close to Mumbai, Goa is a tourist’s paradise which becomes more verdant in the rainy season. When it rains in Goa, the rivers become bubblier than before, the leaves on the trees are sparkling clean and the wind chimes through them musically. To a new visitor, monsoon in Goa is full of surprises – it can mean sudden bursts of torrential downpours that usually last for a short time, although there are occasional periods when it rains for hours on end. These sudden bursts are always succeeded by bright sunshine that lights up the countryside in brilliant colours. Being close to Arabian Sea, Goa boasts of excellent seafood which add an excellent list toIndian food recipes. The fresh supply of seafood and coconuts dominate delicacies of Goa. During the monsoon, from mid June till end September, fresh fish is scarce and people have to be satisfied with fish caught in the rivers and creeks. During this season, it is salted shrimps and mackerels (prepared in numerous mouth watering ways) that find their way to the family table. It’s ‘no-fishing’ time during the months of rain and the fish loving locals are well prepared. They dry, salt and store seafood to use when there is no fresh catch of the day. The requisites for authentic Goan cooking are certain ingredients peculiar to it like triphala and kokum. Hardly any Goan dish is complete without coconut as one of its main flavouring agents. Fresh coconut, in one form or other is added. Fish ambotik served with rice is one of my favourite combinations. A Goan wedding is a many splendoured affair. The wedding ceremony comprises of a number of rituals and the end of which the guests and the hosts partake of a sumptuous meal the menu of which is more or less fixed. It comprises of lonche (pickle), papad, coconut chutney, koshimbir, muga gathi (a gravied dish of whole green gram), batata bhaji, bhajee (vegetable fritters), panchamrut (a sweet sour chutney of coconut and dry fruits), varan bhaat, masale bhaat, jalebi, shrikhand and finally rounded off with tival (kokum extract tempered with mustard, asafoetida and curry leaves). The various influences have made the Goan cuisine an interesting blend of tastes as a result of which it has a phenomenal repertoire of both vegetarian and non-vegetarian delicacies. Though the recipes and techniques of the two major communities – Hindu and Christian – are different but as a rule the cuisine that comes under the umbrella of Goan is simple but chilli hot and spicy. Traditionally the food is cooked on wood fires in clay pots that are fired by the village potter. Though in the modern times, quite a few Goans have had to leave their land in search of greener pastures, they still get homesick for the smoky flavor of the fish curry and rice that get their distinct taste being cooked in crowded sweaty, smoky kitchens in earthenware pots over wood fires, a tribute to the legacy of Indian food recipes. Left for Georgia last night, with Alyona and a few associates for business purposes and explore new avenues in it. Hoping to discover the country as well besides the work schedule as I will be staying there for this week. Just after I come back to Mumbai on July 10, 2012, immediately the next day, will be my trip to Dubai for my channel FoodFood’s event. Other things – had a great time with my brother and his family as they were in town last weekend. I cooked up Laksa for the Sunday lunch and we all enjoyed it together. The weather was also just perfect to accompany with it. Monday began with a puja for the new office as Indian Cookery Private Limited (ICPL) shifted in our premises. I was there with some of my team members and we relished some delectable snacks that were served with the high-tea. Then, in the night I had a delicious Sindhi dinner at one of my close friend’s house. All-in-all a good time!